So the Kurugaya’s route is officially over and we are diving straight into Rin 2. Conclusions first: it was actually quite good. From an execution perspective many things were done rather well, with my only major complaint being perhaps slightly too much monologue. It made me want to read the visual novel again, which in my opinion is a good thing. As for substance, I must note again that the anime version of the Kurugaya route is a distinguishably different animal from its visual novel incarnation. At the risk of being repetitive (again), the Kurugaya route, like the Mio route, had heavy romance elements that played into the main themes of the story. Like the Mio route precedence, the anime strips much of those elements, and in turn alters those themes. The Kurugaya route of the anime is still a love story, to be sure, but it is ultimately an unrequited love, and that colours much of the subtext in a different light. The relationship of lovers does not get explored like the emotion of love, which is in turn overshadowed by Rikki’s reaction to the time loop, and the transience of time. 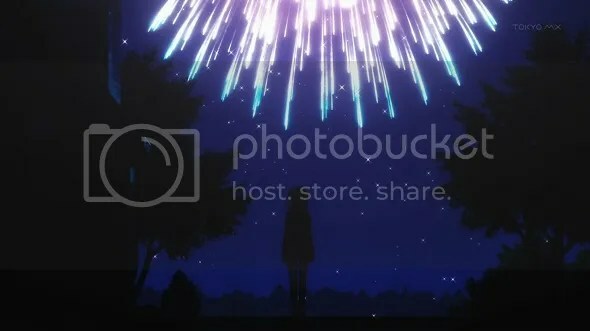 Consider, for example, the symbolism of fireworks. Great scene. Still hijacked by Rin. This was done, obviously, because they are adopting the formula that Kyoto Animation used for adapting Key VNs–everything is platonic save for the ‘main girl’. 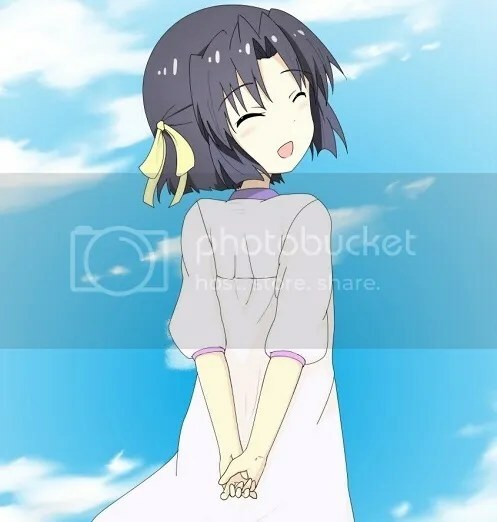 Actually, for all the comparisons people made between Kyoto Animation vs JC Staff vis a vis adapting Little Busters!, a lot of the structure of lessons from Clannad were applied to Little Busters!. Putting After Story/Refrain into a second season, amalgamating all side routes into the common route, even rearranging a BGM track as the second season title song–they’re good ideas and there’s no reason to deviate, in my opinion. In any case, it is apparent that the reigning policy is that all must bow to the One True Pairing that is Riki x Rin. Or do we? Refrain is not really about OTPs–heck, neither was After Story, really. I would say that both Clannad and Little Busters are ‘love stories’, but not in the traditional sense. They are about different forms of love–love between family and love between friends respectively. In that vein, the romance of Refrain is largely subdued. 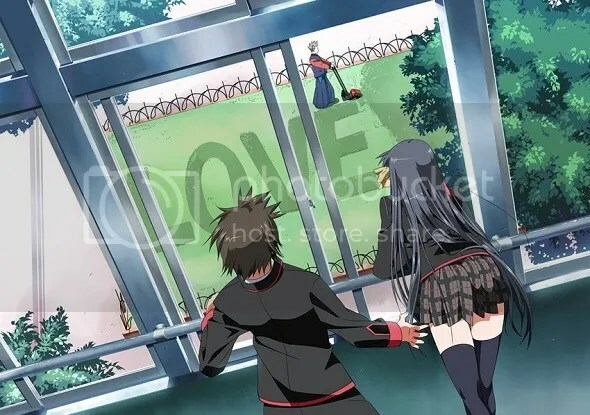 Even Rin 2 is less a sweeping true love story and more an extension of the predominant coming of age story of Little Busters. Two kids poke around and explore their sudden and newfound relationships, and lessons are learnt about what it really means to care about someone. More on that when Rin 2 finishes its episode run. What about the Kurugaya route? I want to get into it a bit, but that would require spoilers for the Kurugaya route in the visual novel. Don’t worry; I’ll mark the start and end of the spoilers with pictures. Scroll and jump as you please. To recap for those of you who haven’t read the visual novel: a large part of Kurugaya’s route is basically just Riki and Kurugaya being in love. 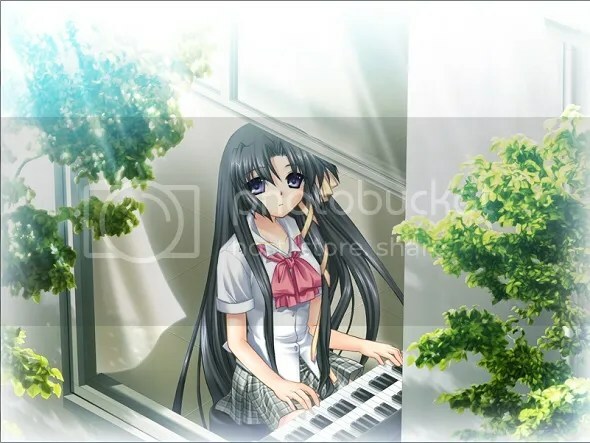 In the visual novel, Riki first falls in love with Kurugaya and, as the Little Busters push him to express it, Kurugaya gradually awakens to the new emotion. In time they get into cliche couple mode and have lunch together, go on dates, talk about going on dates, yada yada. The tragic twist is a old chestnut–as June starts to loop and the ‘dream’ collapse, Kurugaya begins to lose memories. In a move reminiscent of ef, she refers to her diary and tries to pretend that all is dandy, but eventually the facade crumbles. So while the anime only got into the immediate ’emotion’ of love, the visual novel gets deep into the ‘relationship’. It’s a common enquiry throughout all of Little Busters, really. The hypothesis presented to us in the Kurugaya’s route is that a relationship is built upon shared experiences, and those are built by time. Of course, it’s never that simple. While Riki and Kurugaya spend a lot of time together during the loop, their relationship doesn’t so much develop as stagnate, and the fond memories only fade as time passes. But it is also implied that there are very fundamental connections that never really go away. Both Riki and Kurugaya ultimately forget about the entire thing, but it’s still hinted that there are lingering attachments. In fact, that’s one of the Big Ideas of Little Busters: although everything but Common–>Rin–>Refrain are arguably side routes, they are still part of Riki’s experiences. It’s like childhood; even if one forgets, those experiences were still what makes one into what they are as adults. And of course, there is the piano. The one which is always playing, but nobody hears. So, yeah, I do think that a lot was lost from the Kurugaya route. Heck, we could have kept all of the romantic fluff and still do a rest into Rin 2; it’s what I had hoped they would do after watching Season 1. Time limitations, I suppose. It’s a bit tragic. So now we are well into Rin time. We’ve come to a point where I shouldn’t have to make excuses for JC Staff anymore; everything up til now was for this. I must confess that my expectations are very high, simply because I set the original visual novel on a very high standard. Frankly, there is not much room for error anymore; from this point on we will have to ramp straight up into Refrain without looking back. Once the emotional rollercoaster starts, so to speak, there is no slowing down save by speeding down the slope of catharsis. Alternatively, crashing and burning but I don’t foresee that happening. Cross your fingers. Compared to Kurugaya’s route Rin 2 is relatively naive. Rin and Riki do not ‘fall in love’ in any dramatic fashion; they have a relationship, seek to develop that relationship, and only after that do we have introspection about that relationship actually is. ‘What is love?’ is done to death, but Rin 2 is also about the how and the why. The reason that Rin 2 is not really a romantic route is that it doesn’t need to be. Riki cares about Rin. That’s it. Working out the details is secondary. His foil here is Kyousuke–let’s be honest, his foil is always Kyousuke–who obviously also cares a lot about his sister. Kyousuke has the benefit of having been elder brother most of his life; Riki jumps straight from friend to lover overnight. Remember that Rin is a problem child. And in a different sense, so is Riki. The culminations of their trials and tribulations approach. ‘For whom do we move foward?